Not much time to write this week. Things are kicking into high gear in the studio/shop getting everything ready to load out for the exhibit. Thought I would just post some photos of us while we are moving as fast as we can. Working in the enclosed booth cuts down on dust but I still have to suit up to make sure I am not breathing fine particles that escape. I need to decide how to finish “On the Divide.” So many decisions. We are pulling all the display easels out to evaluate. My upstairs design and drawing area. Stacks of wolves waiting for their finish coat. Charlie selecting wood for frames. Gilding the net on Wynken, Blynken and Nod. Mike is working on getting the word out, helping with communications. Sequence is stacked in front of a panel from Golden Goose. I am very excited to work with the Woodson Art Museum staff since we have so much scheduled. First week of December, I will be working with fine craftsmen on staff to install the artwork and create the forest. The following two weeks I will get to work with the educators on programing for 600 kids! Should be a lot of fun. 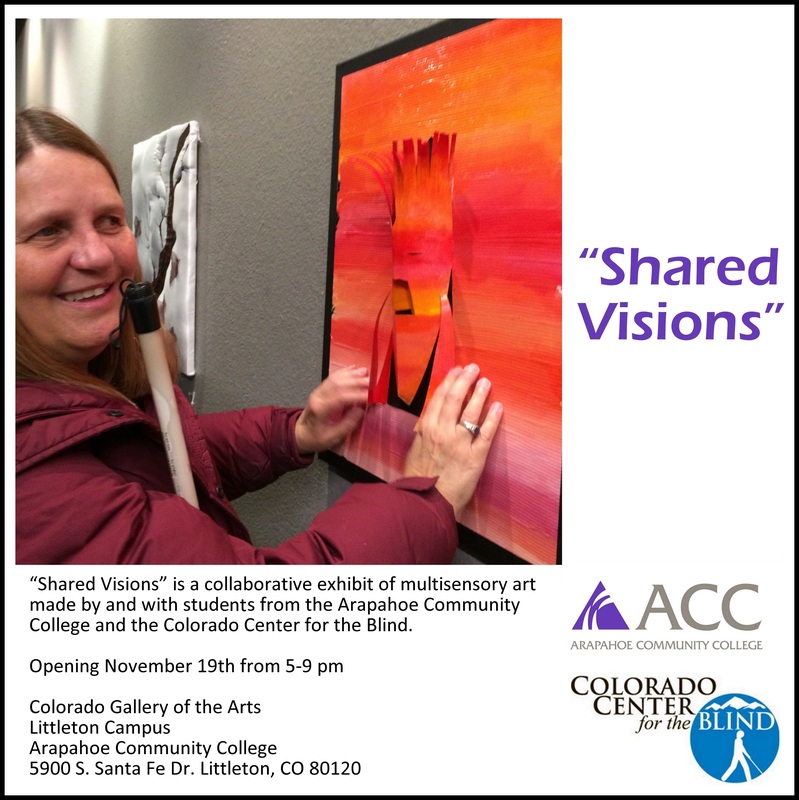 Hello, my name is Jenny Callahan and I am one of Ann’s art students at the Colorado Center for the Blind. 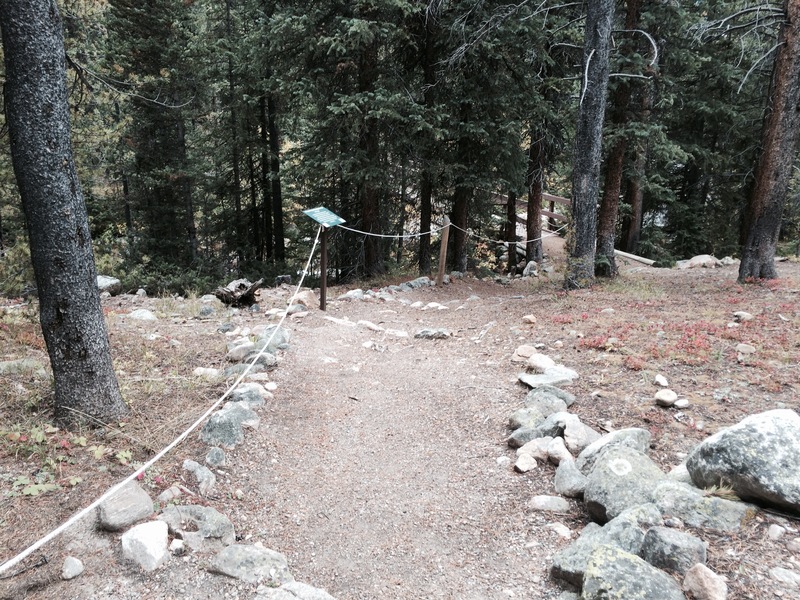 Today, I am going to share with you about the Braille Trail in Aspen, Colorado. I love braille both as a form of communication and also as a tactile art-form. I love incorporating braille in art projects, especially clay and acrylic painting. 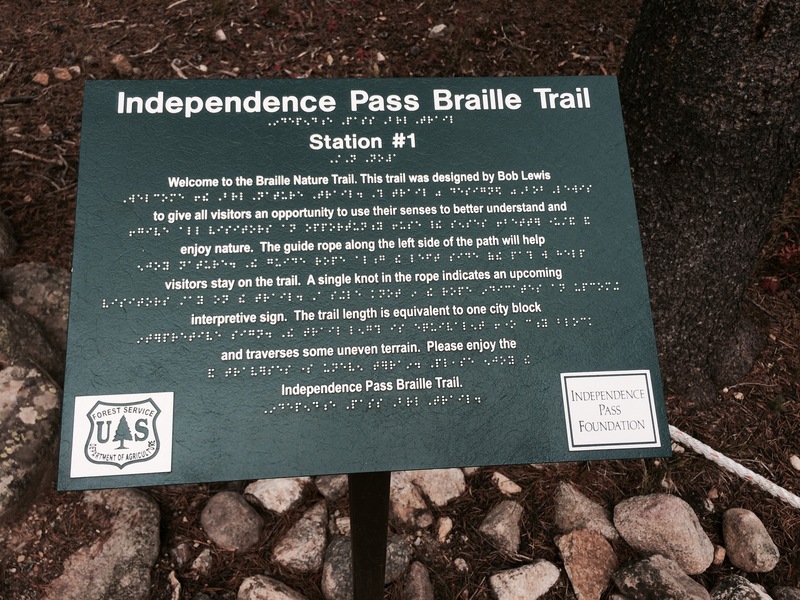 What is the Braille Trail? While today there are more than 100 braille trails throughout the country, in 1962 the concept had yet to be created. A science teacher by the name of Bob Lewis happened across a book his 12-year-old daughter had brought home, that described the code invented by Louis Braille. This inadvertent inspiration prompted Bob to conceive the idea of the trail. This began a five-year process to secure an area from the Forestry Service. In that time he also designed the trail and organized the installation of the signs with descriptions of spots on the trail written by a naturalist. The metal signs are in both braille and print. The trail has a guide rope along one side of the path. This makes navigation with dog, cane or sighted guide very easy over the rough terrain. On this trail, Braille is used to allow a closer inspection of nature through the senses of touch, smell, and hearing. The path itself is on rocky terrain in a forest. A friend described it as a very informative experience with the signs describing the flora of the forest. An interesting side note, bird droppings had to be removed from some of the braille signs (extra dots). The trail itself is not very long. However, the upkeep and maintenance on the trail is quite expensive. The trail is maintained by the Independence Pass Foundation. When Ann told me about her random stop – when driving to Aspen, upon seeing a sign for the Braille Trail – it reminded me of many of my own road trip adventures. And, it reminds me how, just as how Bob Lewis saw an opportunity to merge art and science, in the absence of a sense, being open to new roadside adventures can also help us create new types of art. The braille trail also reminds me of the sacred mountains in China. That even though I can’t see now, I can picture them so vividly in my mind with the trails clinging to the sides of the mountain with just one or two boards and the ropes climbing up the side of the mountain into the clouds. And this is how I picture the Braille Trail, rising into the clouds, up the craggy rocks, dripping in pungent leafy smells. Come experience what we can do when we combine our creative forces! The new exhibit at the Colorado Gallery of the Arts at the Littleton Campus of Arapahoe Community College features a unique combination of tactile and multisensory artworks created by ACC painting and ceramics students as well as our neighbors at the Colorado Center for the Blind. The second annual “Shared Visions” exhibit is full of artwork you can touch. The opening on Thursday, November 19th from 5-9 pm will be a truly memorable event. Everyone is welcome! 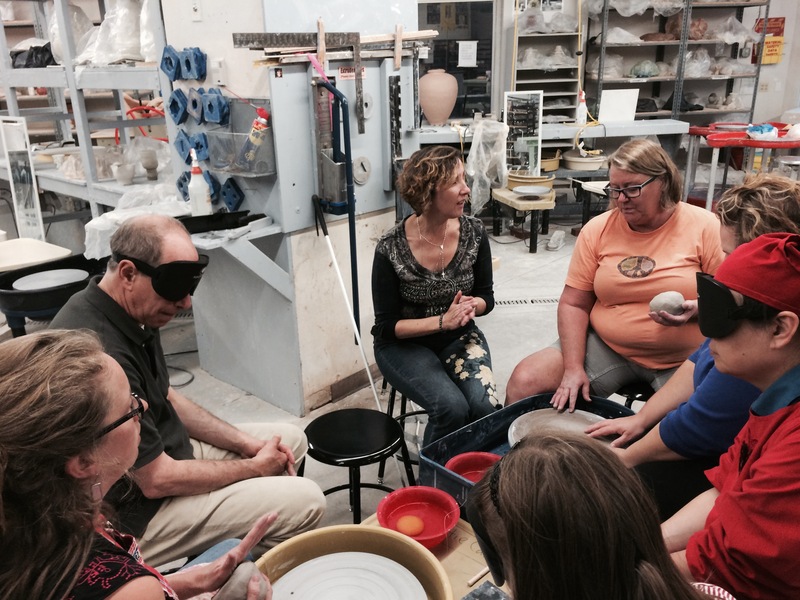 Jenny Callahan and 7 other students from The Colorado Center for the Blind (CCB) joined Katy Carons ceramics class at Arapahoe Community College. 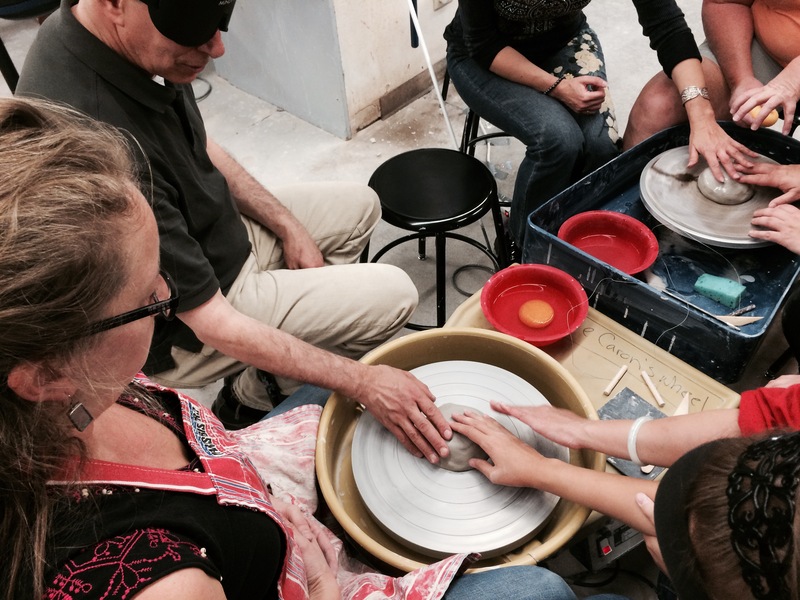 CCB will exhibit the bowls they created in this class, along with other works of art at Shared Visions. I hope you will join us on November 19th at Arapahoe Community College for our opening event.